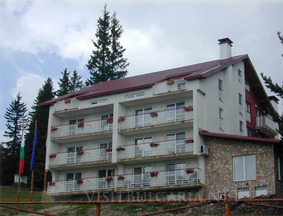 The Family Hotel "Villa Dessislava" is to be found on the southern slopes of Rila in the area of Treshtenik at an altitude of 1695m above sea level, 40km from Razlog, 14km north of Yakorouda and 150km from Sofia. The hotel has 7 suites and 7 double rooms (each with a telephone, a mini bar, satellite TV) overlooking the beautiful mountain peaks of three mountains – Rila, Pirin and the Rhodopes. At the disposal of the guest is a restaurant, a lobby bar with fireplace, barbecue, a conference hall, sauna, billiards and motor sledges. The Treshtenik tourist complex is located in a picturesque region on the southern slopes of the Eastern Rila Mountains at 1695m among extensive meadows and spruce forests. On a clear day, a beautiful panoramic view of Rhodoppi villages and the high mountain peaks of Pirin and Rila reveals itself. In the vicinity of Treshtenik, outstanding opportunities exist for all-year-round short outings and holidays. Treshtenik is a convenient starting point for many of the hiking routes through the Rila Mountains.